How Learning Languages Affects Our Brain #infographic ~ Visualistan '+g+"
Learning a new language is not an easy task at all. There is so many weird rules, unfamiliar words and pronunciation problems that most of the time you believe that you’ll never learn anything. It is easy to feel discouraged and to give up. But, the truth is that you are catching up faster than you believe and soon you will manage to master it and become a real expert. Or at least you’ll learn enough to order a tea next time you are visiting the country whose language you are learning. But did you know that mastering a new language has more great benefits than just improving your foreign communication skills? Learning a new language is linked with the growth in the hippocampus and areas of the cerebral cortex, the parts of your brain that are associated with memory, thought and action. Not bad, right? 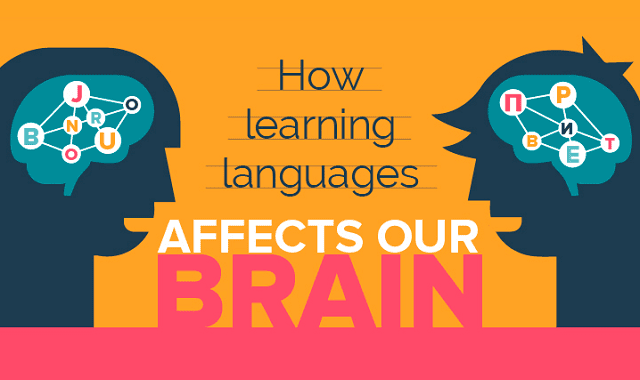 Discover more benefits of learning a new language in this interesting infographic.